Dinora Felske Justice’s new oil paintings take her process of landscape painting to a new level of conception. In the current exhibit, Ms. Justice reveals her process of simplification, alluded to in the title of the exhibit, and presents us with a totally new idea – a landscape in the minimalist style paired with a painting that is representational. 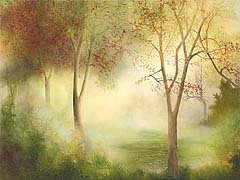 In the artist’s words: “Landscape painting is a process of simplification – one cannot possibly paint everything one sees. The eye organizes, edits, contrasts, simplifies. Taking this process one step further, and reversing its order, my series of “sibling” paintings” creates a visual interplay of this aspect of landscape painting." Starting with the process of handling the painting materials – canvas, stretchers, groun – I create a “gesture” on and with the canvas. This gesture becomes the anchor and the common denominator of two inter-related paintings, on which I work simultaneously. The result may seem, at first sight, two very different paintings in style: one looks like a traditional landscape, the other looks like a minimalist composition – but their strong common bond reveals itself upon closer scrutiny. This inter-relatedness and connectedness, despite apparent differences, is a point of great interest to me, something I look for in art as well as in life. If one thinks of Landscape Painting as the manipulation and organization of space, the line of thought that has brought me to my current work appears logical, yet my approach to painting in general is to strive for an intuitive, fluid state. Three-dimensional works like “Cathedral,” “An Alteration of the Physical Landscape – Wrapped Around the Corner” and earlier works like “42 Points of View,” are examples of my ongoing interest in the relationship of the viewer with the artwork in space, not to mention the relationship of people with the natural environment, my subject matter. In mentioning environment, it is important to note that there is evidence of the process of “add it all up, then simplify” going on around us all the time. It is a basic mathematical principle which can be related to things apparently as diverse as spirituality (Kabbalah is a good example), science and art (Perspective and the Golden Rectangle come to mind). Art does not exist in a vacuum, nor does anything else.